All Ventura homes currently listed for sale in Ventura as of 04/18/2019 are shown below. You can change the search criteria at any time by pressing the 'Change Search' button below. If you have any questions or you would like more information about any Ventura homes for sale or other Ventura real estate, please contact us and one of our knowledgeable Ventura REALTORS® would be pleased to assist you. "The opportunity of a lifetime awaits you at this beachfront custom- built modern luxury home!!! This architectural masterpiece with 4 bedrooms, 6 bathrooms on an almost 8,000 sq. ft. lot is situated right on the sand in the highly desirable area of ''Faria Beach'' with stunning views of the Channel Islands. Koi Fish Pond at entry leads you into the newly constructed high-end and handmade interior design that can be easily customized to your taste and desire. The ultimate elegance and class, this home features a large library with ocean views, oversized walk-in closets, an elevator that serves all floors, a sauna and a wine cellar. Savor a soak in the big size swimming pool and jacuzzi adjacent from the living room 's amazing 32 feet glass folding pocket doors. Spectacular ocean views and soothing ocean sounds awaits you in this California custom-built estate located just 30 minutes to Santa Barbara and Malibu. This California Rivera Gem has an estimated completion date at the end of 2019!" "Luxurious & ultra comfortable beach home with timeless elegance & a stunning indoor/outdoor lifestyle. Home was rebuilt w/ the finest craftsmanship, expanses of glass & pristine interiors include wide plank French oak floors, striking skylit staircase, rich paneling, beautiful marble baths, & custom built-ins throughout. Cozy upstairs media room, large raised mahogany deck with outdoor dining, fireplace, built-in seating, & inset hot tub, all with the stunning pacific ocean as its backdrop. Located w/in the gated & quaint Seacliff Beach Colony, w/ convenient access to & from highway 101, just a short distance to Montecito, Ventura & LA"
"Coastal elegance combines with spectacular views in this contemporary tri-level home complete with elevator in the Seacliff Beach Colony. With 50 feet of ocean frontage, the seascape through nine-foot high windows and sliders is breathtaking. The oceanfront stone and landscaped sundeck allows for unobstructed views of the Pacific Ocean and Channel Islands. Designed to maximize its location, the home offers stunning views from many vantage points. Its finishings were creatively selected for both comfort and style, and the open-plan layout functions for the enjoyment of its residents or entertaining guests. Romantic and serene, the oceanfront master has a large balcony, fireplace and sitting area. Every bedroom has an en suite, and one of the upstairs bedrooms has a private deck. Additional fireplaces are in the living and family rooms. A protected courtyard terrace adjacent to the family room is ideal for outdoor entertaining. The first floor offers a bedroom with private entrance. The Seacliff Beach Colony is a gated enclave of 49 homes tucked on the coast halfway between Ventura and Montecito. Within the gates of the Colony, this home is well-located at the Southern end, which is among the most private of locations. Move in today, entertain tonight!" "The ultimate beach house, 41+/- feet beach front, remodeled and offering top quality finishes, stunning ocean views (and daily dolphin sightings) and miles of soft sand. Behind the gates at Solimar Beach, this sparkling bright two story home features cathedral ceilings, floor-to-ceiling windows, recessed and custom lighting, tile and 8' plank walnut flooring, walk-in wine room and laundry room. A delightful master chef's kitchen provides a cook's prep area, walk-in pantry, black granite counters and center island, and stainless steel Viking/Fisher Paykel appliances. New en suite Master Bedroom with Carrara marble bathroom." "SURF'S UP! Located right on the beach in the gated community of Seacliff Beach Colony, with easy access to and from coastal Highway 101, convenient north to Santa Barbara and south to Ventura and Los Angeles, this chic remodeled seafront home offers contemporary flair and FUN! Gather in the ''cool'' great room with huge center island, plank flooring, fireplace, and floor-to- ceiling sliders which open to a simply awesome multi-level outdoor entertainment deck. Dine al fresco to candlelight, sip wine in the spa under the milky way, read the day away in the hammock, make castles in the sand. There's plenty of room for family and guests with four bedrooms (one with additional built-in bunks), four full baths, patios and decks. The expansive master suite on the upper level opens via walls of glass to your own private outdoor deck. The adjacent master bath with freestanding tub and separate large shower defines relaxation and luxury. There is a spacious two car garage, ample shared guest parking, two separate laundry facilities (house and garage), outdoor shower and fountain. All you want in a beach house investment: relaxed living, unparalleled ocean/island vistas, soothing sounds of lapping waves, fun in the sun with friends and family, great value!" "BEACHFRONT! On the sand at Faria Beach, this stunning 3,159 sq.ft. Contemporary home has panoramic ocean, island & coastline views, a vast seaside deck & top quality finishes including a free floating aluminum staircase, travertine floors, Texas shell stone fireplace and granite kitchen. The beachfront master suite offers a private balcony, romantic fireplace & marble bath. The spacious guest bedrooms open to the outside to enjoy the fresh sea air. Other amenities include a wine room, wet bar, security and central vacuum systems, 2 car garage and use of nearby tennis courts. Faria Beach is 15 minutes from Santa Barbara & 10 minutes from Ventura, with abundant opportunities for dining & shopping easily reached. Cherished since built by its present owner, this home will bring joy & a fabulous lifestyle to its first new owner." "Welcome to this beautiful ocean front Muscle Shoals home. Wake up to the sound of the ocean. This 5 bedroom, 4 bath home with breathtaking sunset and ocean views from the kitchen, living room, dining room, & two master bedrooms does not disappoint. As you enter this stunning home, you immediately notice the view and privacy. Featured are two levels, each with decks overlooking the ocean. The top floor offers hardwood flooring, new carpet, an updated kitchen with quartz countertops with stainless steel appliances, tile backsplash, & new fixtures. Large open living room, with cozy fireplace & three sliders that lead out to your private deck. Master bedroom with walk in closet, and updated bathroom with a large shower. Second bedrooms is spacious with mirrored closets. Laundry room to accommodate full size washer and dryer. The bottom floor is perfect for entertaining & includes three sliders that lead out to your private deck overlooking the ocean, a kitchenette with granite countertops, wine fridge, sink & dishwasher, laundry with stackable washer & dryer, three bedrooms & two and one half bathrooms. The master bedroom is complete with walk in closet, large bathroom with jacuzzi tub & shower. Slate flooring and new carpet throughout. All the bathrooms in the home have been remodeled and include Toto toilets, Kohler sinks and fixtures. Two car garage and space for another two car garage or courtyard. Just minutes to Ventura and Santa Barbara with abundant dining and shopping"
"52 feet ocean frontage, with magnificent ocean, island and coastline views, and private steps down to the sand, at a prime surfing spot in gated Faria Beach Colony. Larger lot, two car garage, across from green belt and tennis courts. Private gated front courtyard, large ocean-side deck with fire-pit, BBQ, and seawall. Beautifully upgraded and remodeled kitchen and bathrooms with exquisite tiling, open beam ceilings, Saltillo tile floors, fireplace, and wall of glass to enjoy the views. Sliding glass doors to the patio, with full electric operated home screen." "Absolutely spectacular secluded estate located at the end of a quiet cul de sac. This very unique home with ocean and island views from upper level has been thoroughly updated. Privately gated and perfect home for entertaining any size gathering with 5 bedrooms, 4 baths and 1 powder room. A master bedroom suite with french doors opening up to a balcony looking over the backyard, a sitting area, and a cozy fireplace with an exquisite master bath including an expansive his and her closet area. There is one bedroom with a full bath attached on first floor. A large gourmet kitchen with large island and walk in pantry. A large living room with wet bar and fireplace opens up to another well-sized family room both of which open to the backyard through french doors. The formal dining room has french doors opening up to a patio looking out toward the front of the home. Also included, a large parcel being sold with home bringing the total lot to approximately 1.4 acres. On this other property sits a stunning pool with 3 waterfalls, slide, spa, and BBQ center adding to the vast entertaining options. 3 car garage and plenty of RV and other parking and even a basketball court for the sports enthusiasts." "The Roger Understiller Family, Project Beautify, is proud to present their latest designer Beach home. Dedicated to a lifestyle rich in amenities, the stunning new construction 4bd + 4ba home offers the finest location, design and attention to detail. The Chef's Kitchen w/all Viking appliances, counter depth refrigerator, customized cabinets, and Taj Mahal marble surfaces has an island which opens to the ocean view great room w/ marble fireplace. Open your sweeping Lacantina sliders and step out onto the sun drenched decks w/ ocean views. The spa like master provides tranquility and function w/ walk-in closet, exquisite expansive shower, dual vanity & more. Entertainers will bask in the delight of the alluring terrace w/ bult-in bbq, sink, & fridge offering mtn. & city lights views. Smart technology throughout w/ Sonos sound system, cameras, and climate control. All hardwood floors, custom wrought iron work, custom tile work, custom lighting, two master retreats, ensuite bedroom on ground floor, dual heating and A/C, fully landscaped private backyard, two car garage, additional driveway parking, & many more amenities. Truly a master piece in design & function!" "Ventura Main Channel, the ultimate waterfront location! This two-story residence captures the essence of waterfront living while showcasing light & bright open spaces, as well as featuring an extremely desirable floor plan and a extra-large private dock featuring the capacity to accommodate a 50' boat. Walls of glass showcasing unobstructed water and mountain views from the living & dining rooms, kitchen and upstairs master bedroom. This home affords over 2800 SF of interior living space, boasting 3 large bedrooms and 3 baths. One bedroom and bath is located on the first level. The remodeled kitchen has newer cabinets, granite countertops, recessed lighting, stainless appliances. Sit on the large deck outside and savor the sunset, or hop on your paddle board and meander through the harbors many channels with ease from this home. This is the perfect opportunity to make this waterfront home your own." "From first entry into the foyer and throughout, this 3 bedroom, 2 1/2 bath home is stunning and efficient.Its award winning, custom-built home combining Green building components and spectacular views that make it truthfully breathe taking.The open floor plan upper level incorporates the kitchen, dining and living space with a large additional media/family room in the back, and several outdoor deck spaces each present picturesque panoramic hillside and coastal views. The master retreat offers a fireplace, private deck and beautiful ocean, city, and hill views, even from the jetted tub. The home utilizes sustainable, recycled and renewable resources, high efficiency glass with tinting, natural cross ventilation and thermal chimney design, solar energy and hydronic radiant in-floor heating. Built in 2005 with floor to ceiling glass walls for that million dollar view, this home is an entertainer's dream or a great place to cozy up to a fire and relax." 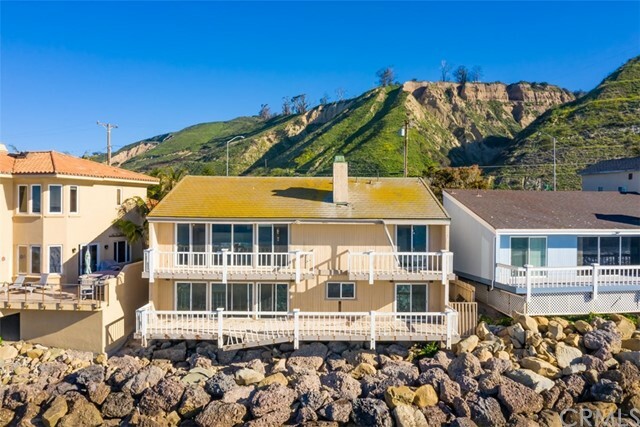 "Upgraded Mussel Shoals Beach Two Story Luxury Duplex Home with 3rd Floor Rooftop Deck Offering Breathtaking Panoramic Ocean, Island, Mountain and Pacific Coast Highway Views. The Bottom Floor Unit Offers 2 Spacious Bedrooms, 1 Bathroom, Open Kitchen Concept Ideal For Entertaining and Large Double Sliders Opening To the Patio Terrace and Backyard. The Lower Unit is Ideal For The In-Laws, Guests, Airbnb Luxury Rental, or Long Term Rental. The 2nd Floor Offers 3 Bedrooms, Large Master Suite with Walk-in Cedar Wood Closet, Separate Private Patio Deck with an Additional Large Viewing Deck Off The Living Room and Kitchen. There's an Oversized 2-Car Garage with Plenty of Storage For The Beach Cruisers, Surfboards and Kids Toys. The 3rd Floor Rooftop Deck Offers Some of The Best Ocean and Island Views in California with Plenty of Room For BBQ'ing, Entertaining, or Just Lay Back and Enjoy Some Sunbathing, Rest and Relaxation. You Must See in Person To Truly Appreciate!" "There are few properties like this one in the heart of Ventura, that have the style and size of this home. The front gates lead to the courtyard to enter the Grand Salon with breathtaking walls of expansive windows, vaulted ceilings, art walls and a massive fireplace of marble - a room designed specifically for collectable artifacts from around the globe. The library is truly a study with a hidden bar and private stairs to the master private retreat. Beyond the master suite is the huge swimming pool with pool house surrounded by gardens, flowers and greenery.On the other side of the Grand Salon, is the dining room that has a real wood dance floor. The hallway continues to the kitchen and breakfast/sitting area and a service area with volumes of storage. The 3 car garage is accessed from the interior hall and an electric gate from the street. Above the garage is an apartment for optional uses.The large yard is a collection of grass, walkways, succulents, flowers, shrubs and eucalyptus trees. The barranca is behind the property, so a huge deck was built to enjoy the quiet and serenity of the expansive open space. The side yard offers a large garden to grow plants for the property. You will want to see this unique estate." "Once the home of Author Erle Stanley Gardner of Perry Mason fame, this hillside home sits on a large rare FLAT lot - so beautiful that weddings have happened here! Enjoy panoramic views of the Pacific Ocean and the Channel Islands from almost every room in the house. Watch the sunsets from the expansive deck. The elegant features of this traditional 1936 home have retained their integrity, yet the floor plan is surprisingly modern and open. There's a small master bedroom down and a master suite with dressing area (or office) up along with two other bedrooms. Guests will enjoy the charming suite with a fireplace above the garage. A stone wall, serene Koi pond and outdoor barbeque patio complete the picture. The versatile finished basement and storage area is perfect for the gardener, artist, or fitness fan. Located at the end of a cul-de-sac in the hills above the high school, 2420 Foster Avenue is close to Ventura's historic downtown shopping/dining/art district and the beach. This is VINTAGE VENTURA at its best!" "*GREAT INVESTMENT! * SINGLE-LEVEL BEACH HOME WITH OCEAN, ISLANDS, BREAKWATER & SUNSET VIEWS, 1 LOT & JUST STEPS FROM THE SAND, ON A RARELY OFFERED, OVERSIZED BEACH LOT! This 50's beach cottage offers 3BR, 2BA & 1724+/- SF of living space & is situated on one of Pierpont's best lanes for its proximity to beach volleyball, the Promenade, Pierpont Village & Downtown Ventura with its myriad eateries, coffee houses, watering holes, theaters & shops. Features include a large living room with Teakwood paneling & stacked stone, wood-burning fireplace, while the dining area's bay windows provide mesmerizing ocean, islands & sunset views. The 50's retro kitchen features the original Teakwood cabinets, plus a unique, fold down dinette. The sound of waves will soothe you to sleep, whether from the en suite master or the light & bright, beach view guest bedrooms, serviced by a guest bath with separate shower, tub & with period tile & hardware. Centrally located between Malibu & Santa Barbara, Ventura is continually ranked as a top city in the U.S. So, whether you enjoy this beach bungalow for what it is or for all its huge potential, if you love strolls on the beach, gorgeous sunsets or simply relaxing, Pierpont living & this lovely beach home is your dream come true!" "Sophistication & style greet you the moment you walk through the front door into a living room taken straight from the pages of Architectural Digest. A wall of windows looks out on passing boats on the short trip to the Pacific, this is a sought after feature of the Ventura Keys.All of the elegant furnishings are included in the purchase of this professionally redesigned &remodeled waterfront retreat.Soaring beamed ceilings & a lovely fireplace make the living room cozy & chic all at once.A nine foot granite-topped bar makes entertaining a breeze. Separate dining room is the perfect setting to enjoy a meal with friends & family. From the outside deck, watch colorful sea-life &boaters pass by. Downstairs boasts a bedroom & ensuite bathroom as well as a sophisticated powder room.Master Suite & 3rd BR at opposite ends of hallway offer complete privacy. Generous master has floor to ceiling windows vaulted ceilings unobstructed views of the water & private balcony. Soothe your tired muscles in the jetted tub or separate glass shower.Loads of storage &more closets make this space a dream.Third bedroom has its own remodeled bath next door. Laundry is a breeze when you have tons of storage, counters & desk area with file drawers.Two car garage also has 3rd bay"
"Resort like living at its finest in this custom home. This one of a kind and newly redone home boasts five bedrooms and 4.5 baths, in 3751 sqft of living space. This stunning home features an open floor plan and all of today's modern amenities offering a mixture of comfort and luxury. The first floor offers a bright living room, formal dining room, a large family room, a magnificent kitchen, a half bath and a bedroom with en suite bathroom. The brand new kitchen is a cooks dream equipped with granite countertops, sub zero refrigerator and freezer, top notch appliances, pantry and breakfast nook.The second floor features a bedroom with en suite bathroom, two other bedrooms, one full bathroom, a large balcony and a large master retreat. The master bedroom has two large walk-in closets, a living area, and a luxurious bathroom, equipped with a bidet, a jacuzzi tub and a steam shower. All windows and doors have electric shutters throughout the home.Entertaining is a dream with a heated pool, spa, fire pit, waterfall, basketball half court and a large built in barbecue. Privacy and lush landscape surround this home.No expense has been spared. It is truly one of a kind!" "Ventura Keys Waterfront Home with Boat Dock! This charming Cape Cod style 3-bedroom, 3-bath home has French doors which open up to a very large deck. Enjoy the sunsets and ocean breeze from this west-facing home. It's a great home for entertaining, with a large kitchen adjacent to the family room and living/dining room. You will love the coffered ceiling and great lighting in the kitchen and family room. Other features include a fireplace, a built-in desk, a large island kitchen with lots of storage and a courtyard off the family room. The bedrooms are upstairs, with their own balcony. The master bedroom has a walk-in closet and master bathroom. There is an oversized two-car garage. Almost every room in this home has a view of the water! Don't miss this opportunity to enjoy coastal living with the water as your ''backyard'', the beach within walking distance, and miles of bike and walking paths along the coast. It's the good life. Make this your next home!" "The Ventura Keys is a destination, a lifestyle unrivaled in charm and access to the Pacific Ocean. There are 300 ''on water'' homes and 400 ''off water'' properties in the Keys. This home has great access to the Big Beach 1 block up Beachmont.This 2642 square foot Ventura Keys home has been beautifully remodeled: 5 bedrooms and 3 full baths, multiple gathering spaces from the open kitchen sitting area to the living /dining area, to the second floor TV and entertainment room, there is plenty of space for everyone! The kitchen has ceramic stone counter tops, stainless steel Viking appliances, stainless steel farm sink, laminate wood-like flooring open to a sitting room and sliders to the landscaped back yard. It is so easy to entertain with a top quality Lion Grill with gas burner on the side, sink and refrigerator with prep area granite counter. The main floor has 3 bedrooms (One bedroom is the master suite) and full bath, open kitchen, living/dining room and ''Wine Room''. Laundry facilities are in the amazing garage. This garage has epoxy flooring, custom cabinets for storage. Upstairs boasts a full bath, huge entertainment room, 2 large bedrooms with ample closets and skylights for natural light.Welcome Home to the BEACH!" "HUGE PRICE REDUCTION!! !Absolutely stunning 210 degrees panoramic views of the Channel Islands awaits you on this one of a kind Hillside Home!!! Located in the historic downtown Ventura, with over an 1/2 acre lot this property offers you many possibilities. Zoning allows for you to expand a multifamily property or single family home with guest house. The original wood beams, brick walls in kitchen and brick surrounded fireplace gives this home a unique mid-century feel. Enjoy the beautiful ocean views and city lights from your living room, dining room and bedroom. Steps away from the beautiful Downtown Ventura where you can enjoy restaurants, museums, entertainment and shopping, take a hike at the newly re-opened Botanical Gardens or stroll along the Pier and Beach Promenade." "Welcome to Pierpont Beach! This beautiful 4 bedroom 2.5 bathroom home has a lot to offer with its recently remodeled kitchen that flows directly to the large backyard, making it perfect for entertaining! Other amenities include cathedral ceiling at the entry, large upstairs great room with stone fireplace that opens to a entertaining deck that faces the ocean. The master suite has a rear balcony and a spa like bathroom which includes a large tub, separate shower, double vanities and walk in closet with built in's. There is ton of detail, craftsmanship and natural light throughout this home that you will notice and appreciate. 2 car garage and large stamped concrete driveway which gives extra beach parking for guests. Close to Marina Park, shopping and Pierpont Elementary. Enjoy the beach lifestyle, just in time for the summer. This is a must see!" "Large, super-clean, 5 + 3 off-water Ventura Keys home. Form, function, versatility, and privacy at its best. This open-concept home with cathedral ceilings has many upgrades/features. Downstairs includes a master bedroom suite, two more bedrooms, another full bathroom, a large mid-century kitchen, living room with fireplace, open dining area, atrium/library, and a family room which opens onto the garden. The main rooms have hickory wood floors or California Tile Works tiles. Sound-proofing was installed between floors to facilitate a private office or granny/guest suite.Upstairs 2+1: includes a huge newly-carpeted den/playroom (currently used as the master bedroom), remodeled bath, and two more spacious bedrooms with plank floors.Smell the sea air from the very private, lovingly landscaped, yard, with large hot tub, palm trees, roses, succulents, orange tree + peach trees that produce fruit generously each year, and plenty of hardscape for BBQ's/entertaining. Just a short distance to Ventura Harbor and Pierpont Beaches. 1/2 a block to Big Beach Park - w/ volleyball and paddle tennis courts, playground, bbq's, and boat dock. Title shows 4+3. Buyer to verify." "Mariposa ocean & Island view home with 3 bedrooms and 2 bathrooms, completely renovated with new Viking stainless steel appliances and wood floors throughout for a custom feel. Multiple accordion door access to decks from the dining room, master and living room, with view of the ocean, city, mountains, and islands. Completely remodeled, this home sits closely to schools, restaurants, and downtown Ventura. Truly a gem.Large lot with room for decks and possible guest home or expansion of existing house."